How Does a Composition Come into Existence?
" How Does a Composition Come into Existence?" Composition does not take place in the vacuum of a private aesthetic. It is always confronted by external forces (which we will call the "world") as well as the internal sources (which we may define as the "soul"). World and soul face one another as estranged entities, in a game of alternating attraction and repulsion. Composition, as an act of self expression, the will to "venture out into the world" (just as it is the will to "take in the world"), is important to me and reflects this process. Whether a composer is aware of the fact or not: composition will always reflect the social conditions in which it takes place. Living in a so-called "post modern" culture (which can be characterized by its general pluralistic attitude) will naturally effect the artistic expression. Nowadays there exists no longer a meta-language (such as during the period of absolutism) which enables the composer to invent something new within a given framework. Today we are faced with a condition of potential infinitude which presents us with a completely new demand: finding an orientation in a situation of "anything goes" without sinking into the dead-end street of "rien ne va plus." However, it would be a mistake to lament this condition. Instead, one can view this situation as an opportunity to unleash new artistic potential rather than taking refuge in the restoration of inherited traditional categories. The ambiguity which characterizes post-modernism could lead to new dialectical thinking. This could put an end to the trivial dualism and make way for a real multivalence. By "multivalence," I do not mean an arbitrary juxtaposition of historical quotations. I mean, rather, the conscious sustaining of the tensions and contradictions between different aspects of a polyvalent material. This provokes an altered thinking: instead of believing in closed systems a new thinking comes into existence which focuses on the transitions between obvious contradictions, which constantly attempts to cross the border; or, more precisely: which will not accept given boundaries, but defines new ones. The question of transition between contrasting states is central to me. Transformational phenomena have always fascinated me, especially in chemistry. In the transformation of one chemical element into another (as a result of the release or absorption of neutrons and protons), in the familial relationships of the elements to one another on the periodic table: here the alchemist's dream of the transformation of substances is realized. What I find captivating, in addition to the qualitative changes, is the convergence of (apparent) opposites. The change in perspective that places this procedure at the center is characterized by an important political dimension: In listening we can detect the absurdity of narrow ideological thought patterns that orient themselves around the simplest bivalent pairs of contrasts . What we experience in hearing is perception itself, which does not only consist of the depiction of an external reality, but which first of all exists in the creative and personal perceptive capabilities of the individual. Before addressing the question of how a composition actually comes into existence, I would like to illustrate these observations on three different levels of composition: material, structure and form. I would like to invite you to participate in a sound experiment with me, which - due to the lack of instruments - will take place in our imagination. Let us select two instruments which at first glance do not seem to have any sonic similarities: flute and percussion. The "typical" sound of a flute can be described as sustained with a definite pitch, whereas the "typical" sound of percussion (e.g. a woodblock) can be characterized as short and impulsive, with a considerable amount of noise and without a specific pitch. The two sounds described here represent a stark contrast. It would be interesting to imagine how a flute could be transformed into a percussion instrument and vice versa. Maybe the sound of the flute could come closer to that of the wood block, and respectively the percussion instrument could take on the spectral character of the flute. We will let the flutist play a so-called tongue click (a click of the tongue with resonance into the tube of the flute) and the percussionist bow one of the bars of a vibraphone with a double-bass bow. With that we have mapped out the extreme polarities. Would it not then be possible to find a way to describe the transition of one state into another? The pure tone of the flute becomes an inharmonically colored multiphonic, and with pizzicato it takes on a percussive character, which with the key click and finally the tongue click becomes more and more noise-like. The high noise component of the wood block transforms itself - over the intermediate stage of the temple block - into the definite pitch of the marimba, which with the vibraphone looses overtones and inharmonicities and with the bowed tone finally becomes similar to the relatively pure sine wave of the flute's tone. We see then that these intermediate stages depict lines of connection or points of transition on a scale , through which the original dissimilarity of sonic characteristics is reconciled. Defined boundaries draw closer to one another and cross over into one another. Through the crossing of boundaries freedom becomes possible. In this way a material could be constructed which is not so to say a matter lying prêt-à-porter on the street, but which is already the result of compositional activity. It presents itself as a meta-instrument, which in this case consists of flute and percussion (which in fact is a conglomeration of different instruments). Such a material is not a static object, but a matrix of relationships: an open and yet definitively demarcated field of possibilities . In composing, I seek to draw creative strength from this conflict of alleged opposites. The question which now presents itself, that of how this still raw material will be interwoven - what actually will be done with it - leads us to the next level of the compositional process, that of structure. Without plunging myself into an ideological discussion of structure, I would like to address one aspect of structure, that of Gestalt. The characteristics of a tree are defined by a model, something which consists of an array of structural qualities. A concrete form (e.g. beech) can also be described as a structural variant of the "tree" model. This concept is also applicable to music: a specific model (the description of a compositional Gestalt) would allow for the generation of thousands of different variants, just as with the primordial plant. If we are now able to describe a tree in terms of a model, then this model could be implemented as a generator, which - although it would not construct actual trees - would produce various images of trees. A computer program, which would generate new tree forms by using the designated model and varying the parameters, would be a suitable implementation of this idea. Such software is already in existence and not only allows for the production of simulated plants, but also of cloud formations, landscapes and surface textures . In the traditional sense, a trill consists of the quick alternation of two neighboring scale tones. However, the principle of the trill can be extended: the quick movement remains, but now more than two tones can be brought in, which - to avoid repetitive patterns - do not run cyclically, but are irregularly permutated. In addition to the duration of a trill, it would also be possible to regard the rate of movement as a variable. Beyond that, changes in rate (ritardandi, accelerandi) could also appear. Dynamic development could be added as the final parameter: swelling and/or fading or a complex envelope. The model of this trill generator is based on a set of parameters from which we can choose. The selection of the corresponding parameter values could be determined by an additional control mechanism, which again would be dependant on another superordinated structural model. It would also be possible - in place of using determinate values - to use chance mechanisms which operate within a given range and produce a wide array of structural variants. The rate of the trill - in the case of instrumental music - orients itself to the scale of human perception. The lower boundary comes into question with a slow value which is just at the point of still imparting the sensation of a trill. Here the model becomes permeable: when one continues to decrease the rate of the trill, the character of a trill is suddenly lost and a new qualitative condition comes into being, which - according to the number of tones - could be perceived as a chord figuration or even as a melodic fragment. 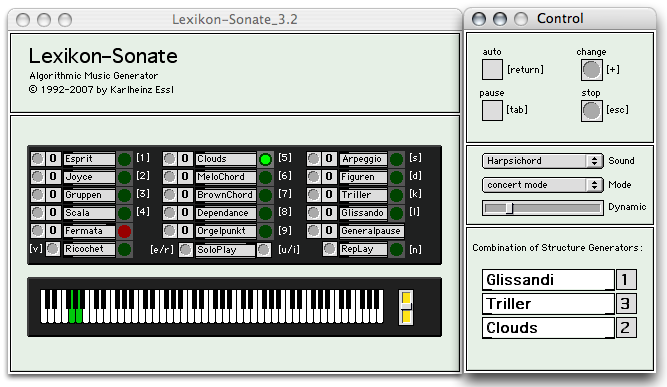 In a composition conceived as a work in progress - Lexikon-Sonate (1992 ff.) an infinite and interactive real time composition for computer-controlled piano  - I have used this principle extensively. The work does not exist in the usual form of fixed notation which is interpreted by a pianist, but exclusively as a computer program, which at the instant of realization generates a new variant of the composition and plays it on a computerized player piano . The software consists of twenty-four different modules, which embraces characteristic topics from the keyboard music since Johann Sebastian Bach: structure generators which for example produce espressivo melodies, chord structures, or motivic figures as well as idiomatic pianistic gestures such as arpeggios, glissandos, and trill figures. with more information of this structure generator and a sounding example. From the combination of these twenty-four modules, new amalgamations of structural models arise, which - without plugging in some direct quotation - can produce allusions  to existing music from Bach, Beethoven, Schumann, Liszt, Schönberg, Webern, Stockhausen, Boulez, Cecil Taylor etc. Of course it is here the active listener who "constructs" these associations based on his or her personal predispositions, and thus becomes a part of the creative process . For me, the most captivating aspect of composing is the reconciliation of these opposites, though each time in a different way. In addition to the works that are conceptualized solely as processes (for example the piece In the Cage ) there are some that have a purely work nature (such as the string quartet Helix 1.0 ); between them are works with a process character (like Entsagung ) and processes with a work character (Lexikon-Sonate ). As an example I would like to demonstrate such a hybrid using the instrumental introduction of Entsagung (1991-93), a piece for flute, bass clarinet, prepared piano, percussion, and live electronics which was commissioned by IRCAM (Paris) in 1992. It starts with a process which begins completely amorphously and during its course displays an ever increasing goal orientation. Each instrumental layer is subject to the same macro-rhythm of acceleration / deceleration / acceleration / deceleration. It is a sort of wave movement which each instrument carries out independently of the others, but which is constructed so that the four coincide at the end. The beginning seems to be amorphous and without definite direction. The different instruments gradually become involved in the activity, entwining with one another and then freeing themselves again. A stringent drift toward a climax first becomes noticeable near the end, where the voices fall together at a common point. In the following diagram the respective entries of the instruments are marked with points. Each line of a system is taken by an instrument: flute, bass clarinet, piano, and percussion. "How Does a Composition Come into Existence?" Now that I have explained the three aspects of material, structure, and form, whose constant contemplation represents the basis of my composing, I would like to answer the question initially posed: "How does a composition come into existence?" In the following paragraphs I will attempt to break down the compositional process into separate stages, although I must admit that in practice this activity is much more complex and at times thoroughly chaotic. 1) The starting point is almost always a commission or specific inspiration, which normally is linked to certain conditions or stipulations. Usually it is a particular instrumentation (e.g. an orchestral piece), a special event (music for a particular room, performance, or installation), or a specific medium (radio art; CD-ROM). 2) Here the imagination is already sparked. For weeks or months before I begin to write, I try to develop a conception of the whole, which at the beginning is still very indefinite, but which acquires sharper outlines in the course of meditation. (Once a whole piece came to me as I dreamt half asleep .) The process of reflection begins at the point in time when the musical piece becomes physically imaginable: How can it be described as a dramma per musica? This is usually the point at which I begin to put the formal ideas worked out in my head to paper in the form of a textual description. Stations and landmarks crystallize, aspects of form emerge and become tangible. 3) Here a new phase of reflection begins: Which structural models can be derived from the formal development and how are they linked to each other? 4) Once the design of the model has been mapped out, I try to formulate it as a computer program, which allows me to gather information from this terra incognita in a spirit of playfulness and curiosity. An interactive feedback process then develops: I gain experience and learn from my "mistakes", and thus am able to refine the model until the result coincides with my internal conception. 5) Then the moment has arrived, when I am ready to feed the "correct" parameter data into the model, and run through the calculation of many possible variants by the aid of the computer program. It is mostly a question of the temporal development of structural elements and sound types ["Klangtypen"] and their defining quantities, which nonetheless never concern the whole piece, rather only a component or layer of it. 6) The parameter columns, as they appear in this table, demand interpretation so that they can be adapted to the respective instrument. At the beginning it is a noisy ppp-tremolo, which lasts for four time units. On the flute this might be a toneless flutter-tonguing, with percussion a snare drum (con corde) quavering as it is rubbed with a jazz brush. Or the entry at number nine - a pitched forte figure at time point 61.66 without any duration (duration: 0.0) and therefore a "point" - could be interpreted as a staccatissimo impulse with a short appoggiatura. I leave it to the imagination of the audience to invent a way of playing this on a dijeridoo. 7) You may have already noticed I have not even mentioned pitch. For me the question of harmony is too personal to be left up to a mechanism. Moreover, my concept of pitch is always related to sound quality, meaning that the image of the sound is primary, with the pitch often being derived from it. That is why you never find any tone rows in my music - I invent various harmonic techniques according to specific requirements - and thus, in this sense surely influenced by Webern, I have a preference for interval manipulations and rudimentary "motivic" phrases. 8) Thus you see that the computer-calculated structural variants do not yet amount to any music in themselves. It is first through compositional realization and interpretation - in which the composer brings in his or her experience and power of imagination - that the work gradually comes into existence in an asymptotic process of convergence. With that, a further aspect gains new meaning: the global context. The interpretation of a single voice or layer, as I have just shown for the purpose of demonstration, never takes place in practice. There are always several interwoven processes involved, which simultaneously "interpret" one another and are brought together into a coherent whole by the composer. Thus the working out of the structural skeleton encoded in score lists becomes a real adventure, because one has all of the threads in one's hand at once, and every local decision has consequences for the global continuity. The computer output provides me with a direction and perhaps a goal as well, but I must find the way myself in a continual process of searching and groping. In this manner, composing gains a dimension which reaches far beyond the mere setting of tones: composition becomes an act of reflection, self-awareness, and discovery. Lecture given at the International Musicological Symposion Austria: 996-1996. Music in a Changing Society on 6 Jan 1996 in Ottawa, Canada. This concept is derived from serial thought patterns of the fifties, which Karlheinz Stockhausen has elucidated in exemplary fashion. - See my essay: Aspekte des Seriellen bei Stockhausen; in: Almanach WIEN MODERN '89, publ. by Lothar Knessl, pp. 90-97 (Vienna 1989). 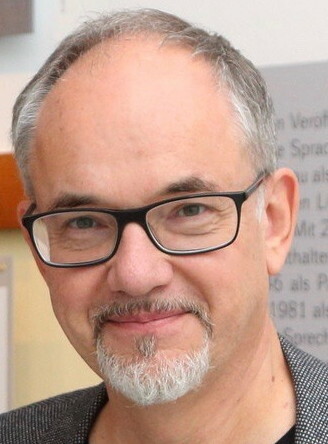 Karlheinz Essl, Klangkomposition und Systemtheorie; in: Darmstädter Beiträge zur Neuen Musik, vol. 20, publ. by Ulrich Mosch and Gianmario Borio in co-operation with Friedrich Hommel (Mainz 1994). Johann Wolfgang von Goethe, Italienische Reise : letter to Herder from 17 May 1787; in: Goethes Werke (Hamburger Ausgabe), publ. by Erich Trunz (Munich 1982), pp. 323-324. Anton Webern was deeply moved by this passage. He underlined it in red in his copy of Goethe's Farbenlehre (where the passage is cited in the foreword by Gunther Ipsen, the publisher) and related his discovery emphatically to Alban Berg (letter to Alban Berg from 3 May 1930; in: Angelika Abel, Die Zwölftontechnik Weberns und Goethes Methodik der Farbenlehre, = BzAfMw 19, Wiesbaden 1982). Years later Webern refered to this passage once again - this time in connection with his last work, the 2nd Cantata op.31 (letter to Willi Reich from 23 August 1941; in: Der Weg zu Neuen Musik [The Path to the New Music, transl. by Leo Black, 1963], publ. by Willi Reich, p. 69, Vienna 1960). Regarding Webern's application of Goethe's theory of metamorphosis in his own compositional approach, see my dissertation: Das Synthese-Denken bei Anton Webern, = Wiener Veröffentlichungen zur Musikwissenschaft, publ. by Othmar Wessely, vol. 24 (Tutzing 1992). Bryce - Kay's Power Tools for Photoshop. Remember as well Lucas Film Ltd., which specialized in computer generated utopian scenarios for science fiction films. Karlheinz Essl, Lexikon-Sonata. An Interactive Realtime Composition for Computer-Controlled Piano; in: Proceedings of the "Second Brazilian Symposium on Computer Music" (Canela 1995). Karlheinz Essl, Lexikon-Sonate. Darmstadt-Lecture 1994; in: ton-gemisch. darmstadt-lectures, publ. by Lothar Knessl (Vienna 1994-95). Bernhard Günther, Irreal-Enzyklopädie - einer metaphorischen Reise - zur Lexikon-Sonata von Karlheinz Essl (Vienna 1995) Ms.
 A Bösendorfer SE Grand Piano was available for the premiere. Now there are also special versions for the Yamaha Disklavier and electronic sampler-pianos. Also compare to György Ligeti's orchestral work Lontano (1967), where wisps of memories of Wagner, Bruckner, and Mahler rise from a fog of tone clusters. Nonetheless, these reminiscences originate from the listener himself, and cannot be directly read from the score. In regard to the role of the listener see: Karlheinz Essl, Kompositorische Konsequenzen des Radikalen Konstruktivismus; in: Positionen. Beiträge zur neuen Musik, publ. by Gisela Nauck, no. 11 "Mind Behind" (Berlin 1992). In the Cage (1988) Performance for 3 speakers (Ms.). Entsagung (1991-93) for flute, bass clarinet, prepared piano, percussion and four channel interactive live-electronics. Lexikon-Sonate (1992 ff.) infinite and interactive real time composition for a computer controlled piano (Ms.). Déviation (1993) for flute, bass clarinet, violin, violincello, piano and percussion. I would like to thank Christopher Barber (Vienna), John H. Silvis (Vienna / New York) and Dennis Patrick (University of Toronto) for their help in translating this article.